It happens to everyone. We give our phone to a child or a youngster and hand them to play a game or watch a youtube video. The next thing we see is they’re deleting your photos or going on something that isn’t for them. Well, guided access is something you need to know. It enables your iPhone to only stay on one app and also disables specific parts of the screen of your liking. 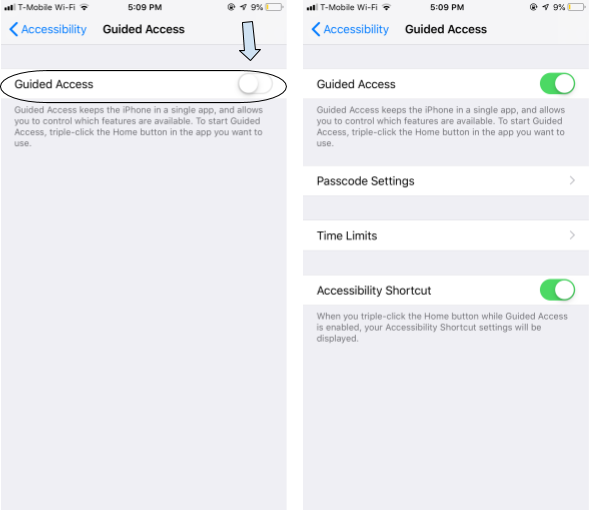 Here is a step-by-step guide on how to enable guided access. Click on the guided access tab and switch on guided access button. You can put a time limit, passcode, shortcuts, and disable different parts of the screens. After you have enabled it, you can toggle to accessibility shortcut button, so when you want to start it, you can go to the app of your choice and triple click your home button. A screen will come and you can click which part of the screen you would like disabled and adjust the size of the circle. After you have disabled of parts of the screen of your liking, you can click start. To stop guided access, you have to triple click the home button, enter your password (if you have enabled password settings), and click end. Hope this helps answer any questions about guided access!